The PNG Immigration Minister’s declaration that the Australian government must get the asylum seekers and refugees out of PNG has made the “Bring Them Here” demand of the refugee movement even more important. Almost exactly two years ago the PNG Supreme Court ordered the PNG and Australian governments, “to cease the unconstitutional and illegal detention of asylum seekers” on Manus Island and to stop the breach of their human rights. Yet more than 600 people are still held on Manus Island, and almost 100 more in Port Moresby. The farce of PNG resettlement came to a dramatic end on 20 February, when PNG police raided the houses of 13 refugees who were supposedly being resettled in Port Moresby. They were arrested and forcibly returned to Manus Island. The PNG Immigration Minister, Petrus Thomas, was stating the obvious when he told the ABC that PNG refugee resettlement had failed. Now the PNG Minister has declared it Australia’s responsibility to find a third country to resettle the refugees. 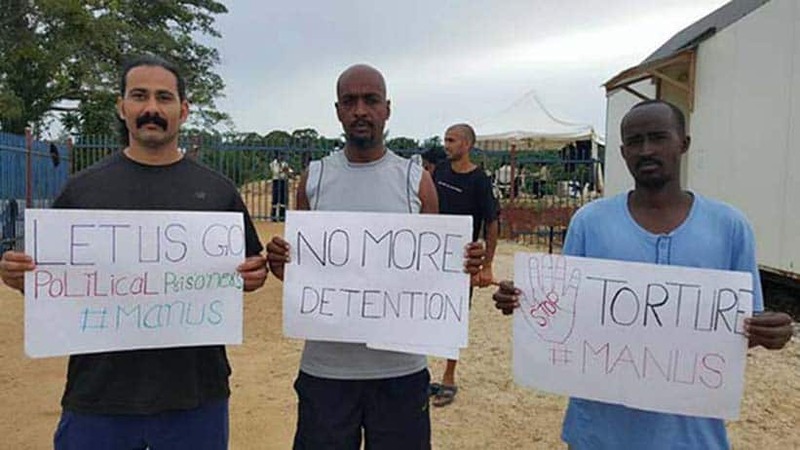 PNG has even set up a task force to negotiate with Australia’s Home Affairs Department to ensure all refugees from Manus Island are resettled in a third country. The task force is one more sign that nothing is resolved on Manus Island, and that it remains a problem for the government. While it is not the first time that the PNG Immigration Minister has said PNG expects Australia to get the refugees off Manus, the announcement will keep the pressure on the Australian government. But Foreign Affairs Minister, Julie Bishop, says that Cambodia is only country other than the US that will take refugees. That’s also a lie. When New Zealand Prime Minister Jacinda Ardern was in Australia in March, she repeated her government’s offer to take 150 refugees a year; but no mention of that from Julie Bishop. The stakes are high. At a recent Senate Estimates hearing, Border Force admitted that up to 500 asylum seekers and refugees could be left on Manus regardless of the US deal. More will be left on Nauru. Refugees have been held on Manus and Nauru for almost five years, yet the government’s only response is to maintain the hell-holes. And Labor is as much to blame. Its bi-partisan support for offshore detention has allowed the brutality and the scapegoating to continue. Thousands of people around Australia will protest and march on Palm Sunday, 25 March, to tell the government to free the refugees, evacuate Manus and Nauru and bring all the asylum seekers and refugees to Australia. At the time of writing, almost 100,000 people have signed a petition calling on the government to return a Tamil asylum seeker family that Border Force officers snatched from a rural town in Queensland. Nades and Priya have lived and worked in Biloela for four years. Their two children were born in Australia. Despite a pending court hearing, Border Force tried to forcibly remove the family from Australia, bundling them onto a plane to Sri Lanka only a day after the court documents were lodged. The family was taken off the plane in Perth at midnight after lawyers were alerted to the removal and initiated an urgent court hearing.